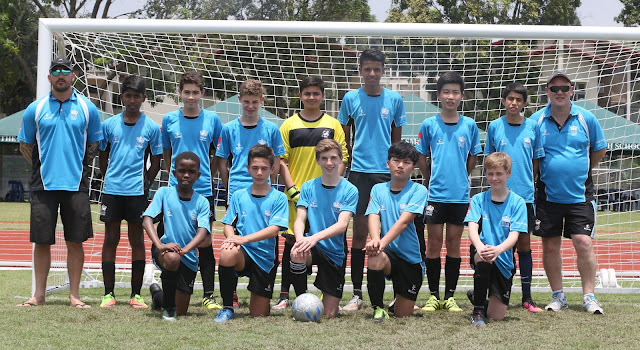 JUST nine months ago Asher Joseph was afraid of a football, but today he is playing for his school team — Nord Anglia International School Shanghai Pudong. It’s all thanks to an education system where sports is a priority. His transformation from “bookworm to athlete” underlines the importance of exposing children to sports in school and to have capable physical education teachers who have the passion and ability to turn raw talent to gems. 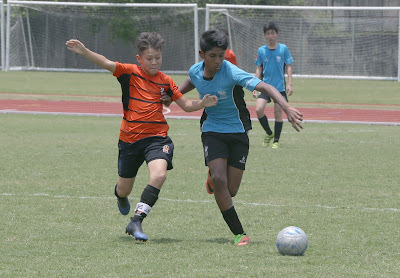 Asher competed in his first international competition representing his school team in The Federation of British Schools in Asia (FOBSIA) Games 2017 hosted by the Alice Smith School, Kuala Lumpur at the secondary campus at Equine Park in Sri Kembangan over the weekend. Annastasia, 41, who retired from walking after the 1998 Commonwealth Games, has no regrets with her decision to move to a foreign land where even the language was alien to her. “Asher was more a bookworm. He was hooked into computer games and never liked outdoor activities. I remember clearly when in the park one day, a football came his way and he ran away screaming,” related Annastasia while watching her son with pride and joy play in the competition on Friday. 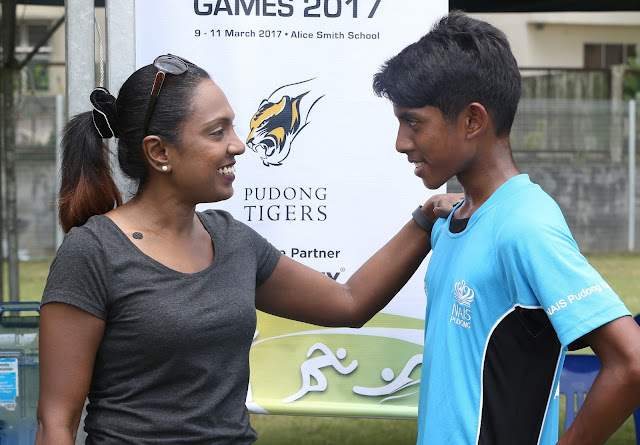 “The school system where sports is emphasised and have very good physical education teachers who ensure that all students are actively involved in sports, made the difference and change for Asher. “The next thing I knew he was into football and surprised me one day when he called me at work to inform me that he had a surprise for me when I came home. “And when reached home, he showed me a trophy he had won at the school athletics meet for the 400m race for his category. “I was pleasantly surprised because I did not know he was involved in athletics. Maybe my genes played a part,” laughed Anna as she is affectionately called. Anna said the next thing he was in the school football team. “But I told him that he was afraid of the ball and how come he was playing the game. But Northedge and the school’s sports director, Noel Wallace, said they were just doing their job in executing the sports syllabus as they did with all the students. “It was actually 90 percent Asher’s effort. He is a very determined and passionate player. He is always seen with the ball before and after training working on his own,” said Wallace. Northedge said that he did not know that Asher had never played football until he joined the school. 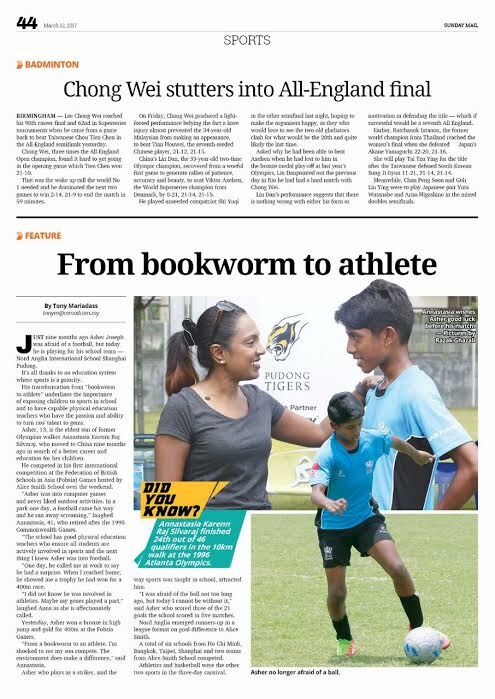 “I had always thought that he had some football background coming from Malaysia. It was only today when Asher’s mother told us that he had never touched a football and was afraid of a ball, that I know he has never played the game,” said Northedge. Asher who plays as a striker said he was so ease at the way sports was taught in school and was attracted to it from day one. 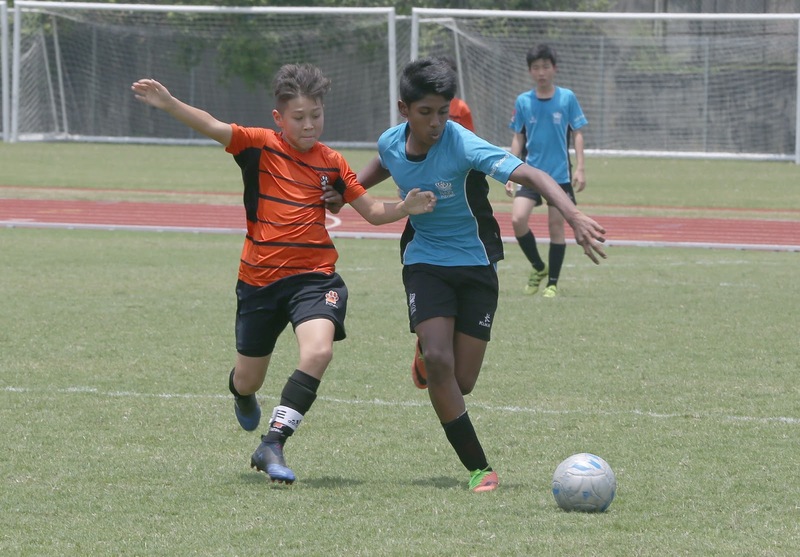 “Yes I was afraid of the ball not too long ago, but today I cannot be without the ball,” said Asher who scored three goals out of the 21 goals the team scored in the five games they played in the competition. 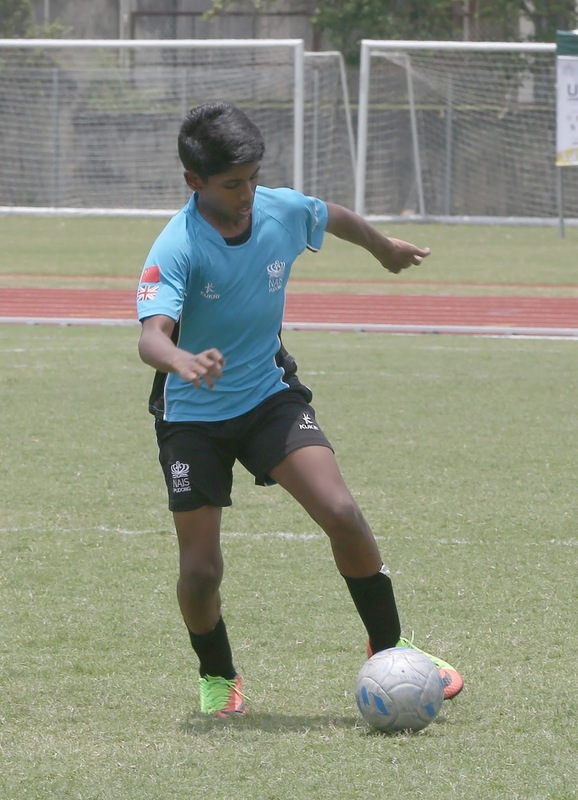 The team emerged runners-up in a league format on goal difference to host Alice Smith School KL. A total of six schools from Ho Chi Minh, Bangkok, Taipei, Shanghai and two teams from Alice Smith School KL competed. Athletics and basketball were the other two sports in the three-day Games carnival. Asher said he was elated to find a place in the school team which comprise of so any nationalities. “It is like an international team with players from UK, South Africa, Hong Kong, India, China, Australia, Italy, Chile and Kenya,” said Asher. “I have learnt a great deal training and playing with them as they have their own style. But as a team, we play one system which the coach has trained us. “It would have been great if we emerged champions, but finishing runners-up and losing out on goal difference to the host, is still a great achievement. “I could not have asked for a better baptism of fire for my debut international tournament. “It is only going to motivate me further to train harder and get better. Asher is also competing in the 400m and hopes to pick up a medal. One wonders if Asher had remained in Malaysia, whether his talent would have been discovered or nurtured to become what he is today. It only underlines how important is he emphasis of sports in school and to have capable physical education teachers who have the passion and ability to turn raw talent to gems. 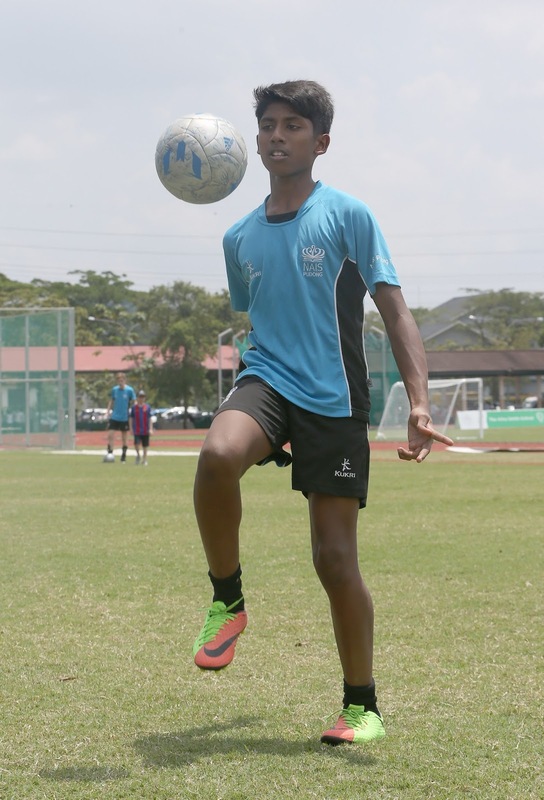 Asher has not only done his parents and his school proud, but as a Malaysian, has done the nation proud to excel in a foreign land and make his mark. 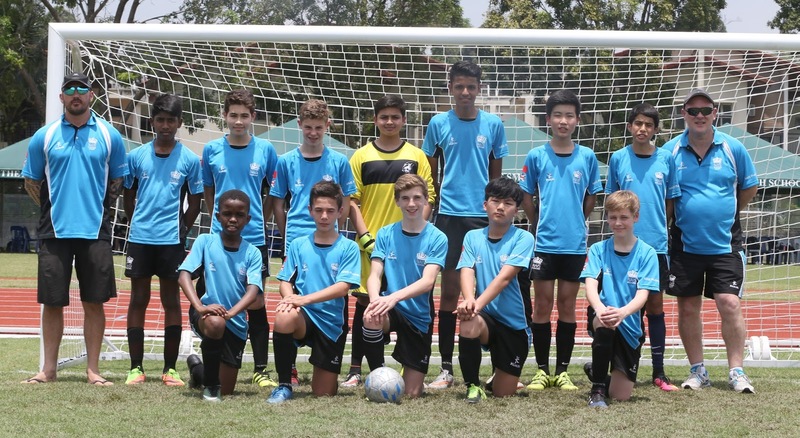 The Nord Anglia International School Pudong football team: Mattew Ward, Yuvraj Singh, Shreyas Tiwari, Andreas Fabbricatorie, George Emery, Matias Marchant Maranon, Lee Jeong Woo, Jack Lee Jeong Woo, Jacob Blows, Warren Gichana, Asher Joseph, Abe Zakhem.